We are looking for qualified referees willing to join our Saturday and Sunday fixture lists. Please drop a mail to youthfixtures@ashteadfc.co.uk to register your interest. Ashtead Football Club is set in the heart of this picturesque Surrey Village, offering football opportunities to all ages with a long history of footballing success at Youth and Adult levels. Season 2018/19 is looking like to be the largest in recent times with 32 teams registered, the majority of which are youth teams aged from under 7 to 18, compomising of over 650 players. We also provide an introduction to football with the Mini Colts Soccer Centre for the 4-10 year olds. This season will also include a girls team at Under 13 age. We are also proud to provide quality football with a Saturday adults and Under 23 team as well as the successful veterans team. The club is situated on Barnett Wood Lane in Ashtead and very close to other sporting facilities including the Cricket Club, the Tennis Club and has a skate park right on our doorstep and a friendly accomodating childrens play area. 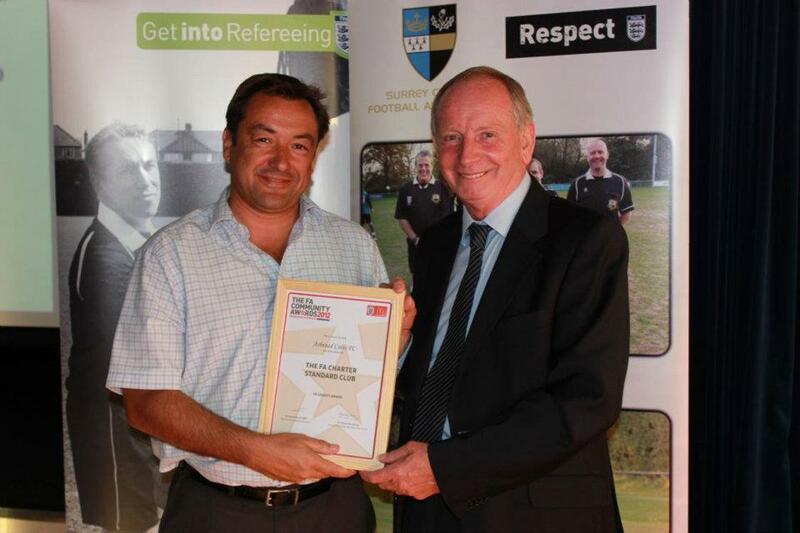 Both the adult, youth and girls sections of the Club have been awarded by the FA as a "Charter Standard Community Club", which is the highest accolade in grassroots football, proving it has a minimum standard of level qualified CRB checked coaches for every team, comprehensive first aiders and strong links with the local community, and being awarded by the Surrey FA "The Charter Standard Club of the year 2012" shows that we are a club of great reputation as well as becoming Fulham FC only community platinum partner in 2014. The recently refurbished clubhouse is the envy of most village clubs with a well stocked bar, patio area, large screen TV with Sky HD, BT Sport and extensive changing facilities, which is available to hire. If you would like to hear more at what happens at the club then please register either as a player or a social member on this site.